European Committee for the Prevention of Torture and Inhuman or Degrading Treatment or Punishment (CPT), Report to the Government of Greece on the visit to Greece carried out by the European Committee for the Prevention of Torture and Inhuman or Degrading Treatment or Punishment (CPT) from 13 to 18 April and 19 to 25 July 2016, CPT/Inf (2017) 25, September 2017, http://www.coe.int/en/web/cpt/greece. Greek Council for Refugees, “Country report: Greece,” Asylum Information Database (AIDA), European Council on Refugees and Exiles (ECRE), December 2016, http://www.asylumineurope.org/reports/country/greece. Ministry of Public Order and Citizen Protection, Letter to Access Info Europe and the Global Detention Project responding to freedom of information request. 17 September 2013. Email correspondence with Izabella Majcher, GDP. October 2013. Email to Izabella Majcher (Global Detention Project). 12 November 2012. Special Rapporteur on the human rights of migrants, Report of the Special Rapporteur on the human rights of migrants on his mission to Greece, A/HRC/35/25/Add.2, 24 April 2017, http://www.ohchr.org/EN/Issues/Migration/SRMigrants/Pages/CountryVisits.aspx. European Committee for the Prevention of Torture and Inhuman or Degrading Treatment or Punishment (CPT), Report to the Government of Greece on the visit to Greece carried out by the European Committee for the Prevention of Torture and Inhuman or Degrading Treatment or Punishment (CPT) from 14 to 23 April 2015, CPT/Inf (2016) 4, March 2016, http://www.coe.int/en/web/cpt/greece. Wave of protests by migrants in greek detention centers continues. 9 April 2013. AITIMA, FORGOTTEN: Administratively detained irregular migrants and asylum seekers, October 2016, http://www.aitima.gr/index.php/en/news/324-10-october-2016-new-aitima-report-forgotten. 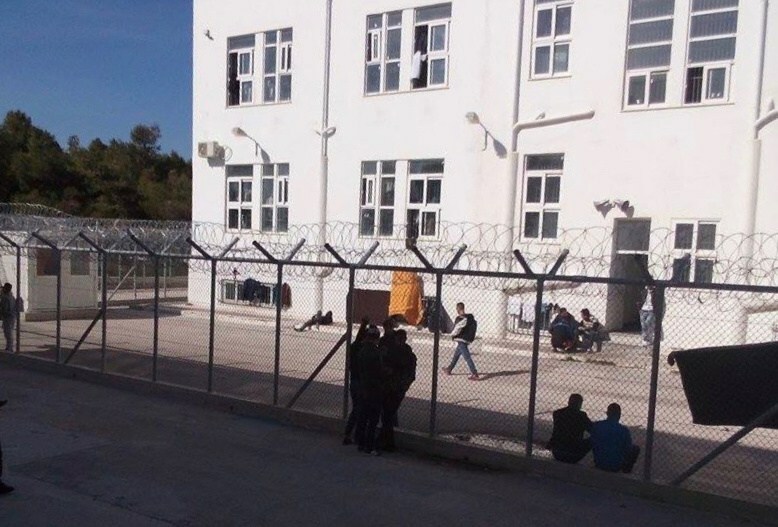 Protest at the detention centre in Corinth reveals inhuman and degrading detention conditions. 22 October 2012.